I have a complaint about science. But it’s not really about science. It’s about scientists. And it’s not really about scientists. It’s about a perfectly understandable error that they make. I can observe how you behave when you say you have a toothache. However, I cannot observe how it feels to you – or indeed, if you feel anything at all. I assume that your experience is similiar to mine when I have a toothache, but that’s an assumption – not an empirical or scientific conclusion. My question is: Where, precisely, does biology teach us that? And the answer is: Biology doesn’t teach us that. A particular philosophical theory assumes it as a postulate. It is neither scientific nor empirically proven. It might be right or it might be wrong, but to bestow on it the sobriquet of “science” is mistaken. The reason why scientists tend to make that mistake is simple: They are scientists, not philosophers. They think about how to conduct their experiments and interpret the results. They don’t think about the limits of their knowledge. They think about what they are studying. They ignore what they’re not studying. That is as it should be. They’re doing science correctly. But just as a plumber thinks that the world revolves around pipes, an economist thinks everything is about economics, and a psychoanalyst thinks everything can be explained by your toilet training, scientists think that everything can be explained – adequately and accurately – by what they study: the physical universe of matter and energy. It’s perfectly natural for them to think that. In a certain sense, everything can be explained by science, simply because of what it means to explain something. To explain X is to give a reason that, logically or causally, leads to X as a result. If a superb basketball player plays badly during a specific game, I can explain it by saying that he had a fight with his girlfriend earlier in the day. That’s an explanation. However, the simple fact that I can offer an explanation doesn’t mean it’s the right explanation. I know that he had a fight with his girlfriend. I merely suppose that it was the cause of his poor performance in the game. It might have nothing to do with his poor performance, or it might be only one of several factors that caused his poor performance. The same applies to breathless pop-science announcements that “we can now explain” love, justice, or near-death experiences as nothing more than brain phenomena. What we can observe are the brain phenomena: electrical activity in certain regions, release of hormones or neurotransmitters, and so on. What we cannot observe is their connection with certain experiences. Nor can we observe (1) the nature of the connection, (2) if there even is a connection, or (3) if there are other factors that have nothing to do with brain states. All we can observe is the correlation between measurable brain states and people’s reports about their experiences at the time. Let’s go back to the authors’ statement that the mind can’t exist without the brain. That’s not a scientific conclusion – and if the authors were being careful, they’d probably agree that it’s not. We cannot observe anyone’s mind except our own. What neuroscientists can observe is, essentially, the same thing as Plato and Aristotle could observe over 2,000 years ago: behavior (including bodily functions), which we take as a marker of consciousness or its absence. People exhibit various kinds of behavior when they’re conscious: They walk around, they talk, and they react to things that happen in their vicinity. People exhibit more limited kinds of behavior when they’re unconscious: They breathe, they have a pulse, and they might move around in limited ways. People exhibit almost no behavior when they’re “dead.” They don’t breathe, they don’t move unless stimulated by some external force, and they start to smell bad after a while. Brain imaging and other neuroscientific methods give us information that is more detailed but is essentially of the same kind. In none of those cases can we observe other people’s mental experiences. Whether people are conscious or unconscious, alive or dead, all we can observe about them is behavior. When they’re dead, we can’t observe their consciousness; but we couldn’t observe it when they were alive, either. So that hasn’t changed. As a matter of efficiency, therefore, scientists ignore mental experiences and focus on behavior. Being human, they often forget that they chose to ignore mental experiences for the sake of efficiency – not because they knew such experiences did not exist, or could not exist independently of a functioning body. They elevate their scientific methodology into a scientific conclusion about the nature of the human mind. Simply as a matter of logic, that’s a mistake. The mind might be identical to the brain, or it might not: but neither neuroscience nor everyday experience prove it one way or the other. Let’s consider an analogous situation. In your living room, you hear some people talking. They talk to you every night – on the radio. The sound of their voices is a function of your radio. Turn the radio on, and you hear their voices. Turn up the volume, and the voices get louder; turn it down, and they get softer. And if I smash the radio, the voices stop completely. When I smashed your radio, did the voices cease to exist? No. As far as you know, the voices and the people are still where they were before, chattering away. What ceased to exist was not the voices, but the radio that enabled them to manifest themselves in your living room. You no longer have empirical evidence that they exist, but you also have no reason to suppose that they don’t exist. At worst, you can only claim to be an agnostic about their continued existence. 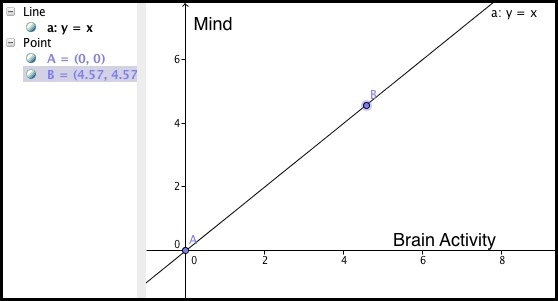 In the graph, consciousness (y) increases as a function of brain activity (x). If brain activity goes to zero, then so does mental activity, and you’re dead (or a member of Congress). But that assumes without justification that only one independent variable is involved. Y could be a function of multiple variables, y= f(x,z,w). You get the same observable results whether consciousness is a function of a single variable or of multiple variables. Therefore, the observable results give you no way to determine if one or multiple independent variables are involved. In the radio example, the single-variable explanation would say that the voices were produced by the radio, and that when the radio ceased to exist, so did the voices. But you know that the radio voices in your living room depend both on the radio and on other factors, such as the radio announcers, the transmitting towers, and the radio waves that travel through the air to your house. Likewise, it’s possible that consciousness is a function only of the brain, with no other factors involved. When a person dies and his or her brain stops working, we no longer see any signs of consciousness. Does it mean that the consciousness ceased to exist – or only that “the radio is broken”? The empirical evidence gives us no basis on which to choose between those alternatives. When scientists claim to know more than that – that “my brain versus me is a false distinction” – they are going beyond the evidence. Whether they know it or not, they are making an affirmation of faith in a materialistic view of the world. They might be right or they might be wrong, but their claim is not scientific.